Looking almost due east at Interstate 405 from the Bristol Street overpass in Costa Mesa near John Wayne Airport (SNA). 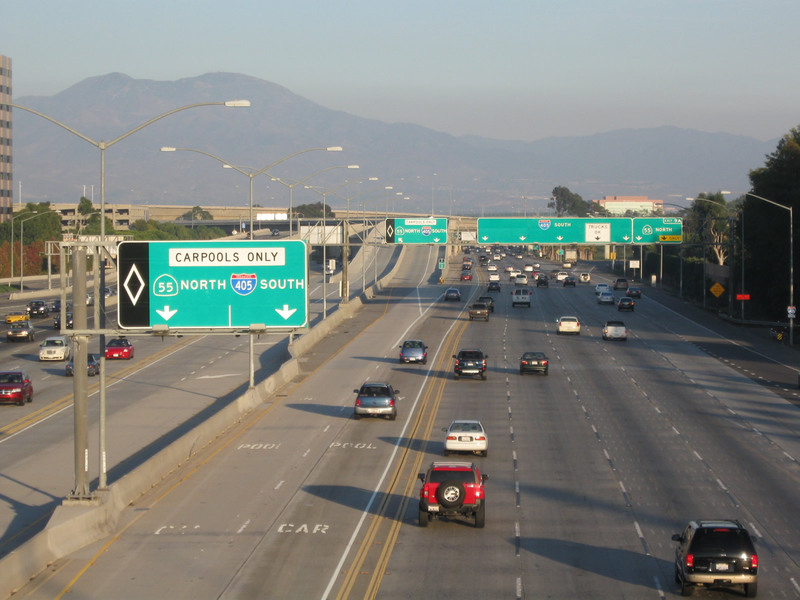 A collection of signs direct motorists onto the a left exit for the California 55 carpool lanes and Exit 9A for the freeway north. Photos taken 10/25/09. Interstate 405 is the San Diego Freeway, starting at Interstate 5 (Golden State Freeway) in northern Los Angeles and paralleling the coast via the vicinity of Santa Monica, Los Angeles International Airport (LAX), Long Beach and Huntington Beach. The freeway returns to Interstate 5 near the former El Toro Marine Corps Station in Irvine. I-405 is arguably the busiest freeway on the West Coast, with traffic a concern at any time during the day or night. Another major overhaul along Interstate 405 is the Orange County Transportation Authority (OCTA) I-405 Improvement Project (SR-73 to I-605) started in winter 2018. Costing $1.9 billion, five years of construction widens 16 miles of the freeway, from Euclid Street (Exit 12) in Fountain Valley to Interstate 605 near Long Beach and Seal Beach. An additional general use lane will be added per direction along with two tolled express lanes along the stretch. Work will also rebuild 18 bridges. Upon completion, the Orange County Transportation Authority will operate the new managed lanes, which will charge rates depending upon traffic flow and time of day.5 HOV eligible traffic will be able to use the carpool lanes at no charge, but will still be required to use a FasTrak transponder. 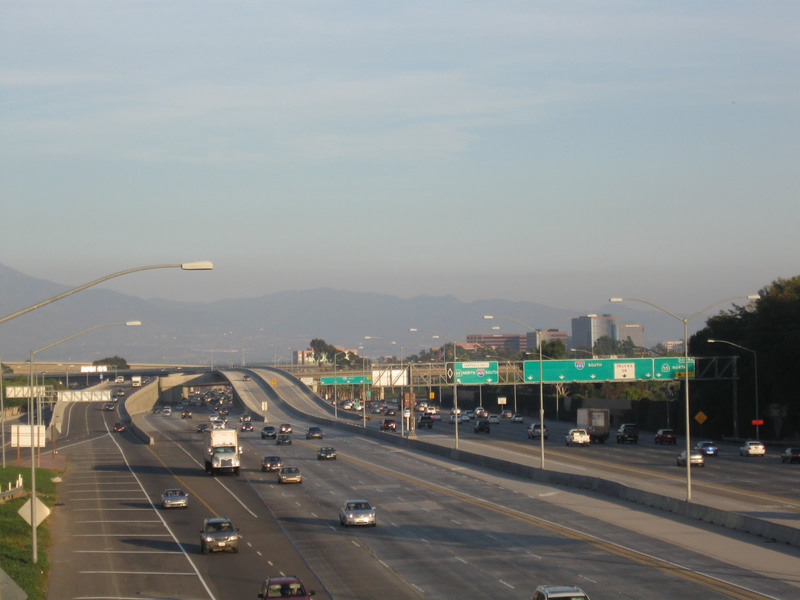 During its construction through west Los Angeles near Santa Monica and Los Angeles International Airport (LAX), the San Diego Freeway was planned as part of former California 7. With the advent of the national Interstate Highway System, the San Diego Freeway was designated as Interstate 405 from Irvine to the San Fernando Valley. Northbound Irvine Center Drive crosses over Interstate 405 and approaches the northbound on-ramp to Long Beach. Photo taken 10/25/09. The Giant Wheel at the Irvine Spectrum Center is one of several attractions at the retail center situated at the apex between Interstates 5 and 405. The towering Ferris wheel is visible from both freeways at their southern convergence. Photos taken 10/25/09. 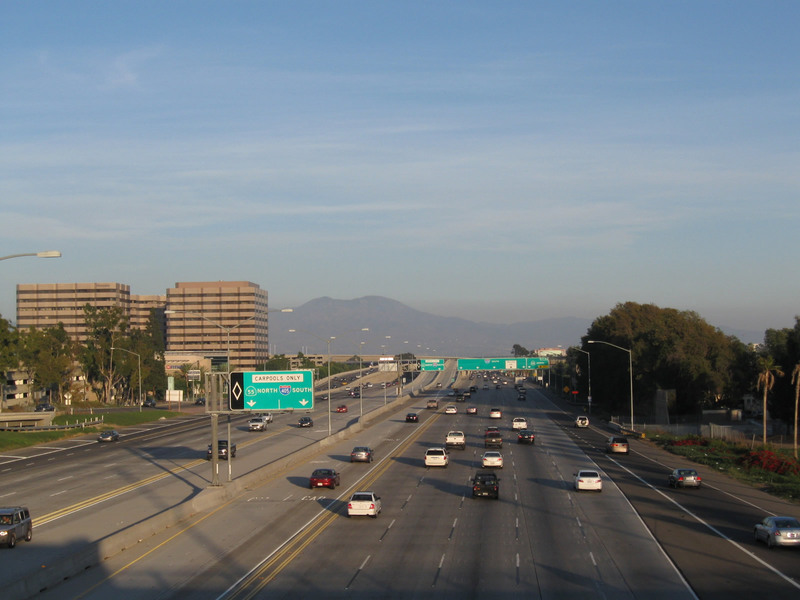 MacArthur Boulevard meets Interstate 405 at the Irvine Business Complex in the city of Irvine. The folded diamond interchange (Exit 9A) with the San Diego Freeway lies adjacent to John Wayne Airport (SNA). Photos taken 10/25/09. Northbound Bristol Street meets Interstate 405 at a parclo interchange (Exit 9B) by South Coast Plaza mall in Costa Mesa. A loop ramp in the southeast quadrant of this exchange was permanently closed in 1995. Photos taken 10/24/09, 10/25/09. These freeway entrance shield assemblies are posted along northbound Bristol Street at the loop ramp onto Interstate 405 north. Photos taken 10/24/09. Detour shield for Interstate 405 previously posted along Bristol Street north between the San Diego Freeway and Anton Boulevard. This assembly was amended to include the state name by 2011 and removed after 2015. Photos taken 10/24/09. Bristol Street runs along the east side of South Coast Plaza mall from Sunflower Avenue to Interstate 405 in Costa Mesa. Photo taken 10/24/09. Southbound Bristol Street connects to Interstate 405 north to Long Beach at this on-ramp. Photo taken 10/24/09. This view looks west at Interstate 405 toward Exit 11A with Coast Coast Drive from the Bristol Street overpass in Costa Mesa. Photo taken 10/24/09. A loop ramp takes motorists from both directions of Bristol Street onto Interstate 405 (San Diego Freeway) south to Irvine and San Diego. Photos taken 10/24/09. A six-ramp parclo interchange (Exit 11B) joins Harbor Boulevard with Interstate 405 on the north side of Costa Mesa. I-405 turns northwest from this exchange to Long Beach and Los Angeles. Photos taken 01/30/05. This I-405 sign precedes Brookhurst Street on Talbert Avenue east in the city of Fountain Valley. A nearly full cloverleaf interchange (Exit 14) joins Brookhurst Street with Interstate 405 nearby. The missing movement to I-405 south utilizes Talbert Avenue east. Photo taken 06/17/06. Talbert Avenue east separates with the southbound on-ramp for the San Diego Freeway to Costa Mesa and Irvine. Photos taken 06/17/06. Bubble shield for Interstate 405 was used for a detour routing in Long Beach along southbound California 1 for a time around 2000. Photo taken 09/22/00. Wilshire Boulevard and Interstate 405 previously converge at a full cloverleaf interchange in the Westwood area of Los Angeles. The Interstate 405 Sepulveda Pass Improvements Project rebuilt a portion of the antiquated exchange, with loop ramps along the east side of I-405 upgraded to flyover ramps. Ramps in the northeast quadrant of the cloverleaf reopened on August 31, 2012.2 Photo taken 03/15/08. Wilshire Boulevard intersects Sepulveda Boulevard (former California 7), the east side frontage road for I-405, ahead of the loop ramp onto the San Diego Freeway southbound. Photo taken 03/15/08. A pair of freeway entrance shields stand at the two lane on-ramp for Interstate 405 south to Inglewood, Hawthorne and Long Beach. Photo taken 03/15/08. Shields and guide signs for Interstate 405 north from Wilshire Boulevard east. This ramp closed on August 22, 2013 for a period of 90 days so that crews could demolish the old structure and build the new flyover. Work was included in the Interstate 405 Sepulveda Pass Improvements Project.3 Photos taken 03/15/08. "405 freeway carpool lane set to open before Memorial Day weekend." KPCC (Southern California Public Radio), May 13, 2014. "Wilshire I-405 ramps reopened early in time for Labor Day weekend." WLS-TV Chicago, August 31, 2012. "405 Freeway's Wilshire Boulevard Onramp Closing Thursday." NBC4 Los Angeles - KNBC, August 21, 2013. "Groundbreaking held for project to improve 110/405 interchange." Metro - Los Angeles County Metropolitan Transportation Authority - The Source, June 1, 2018. 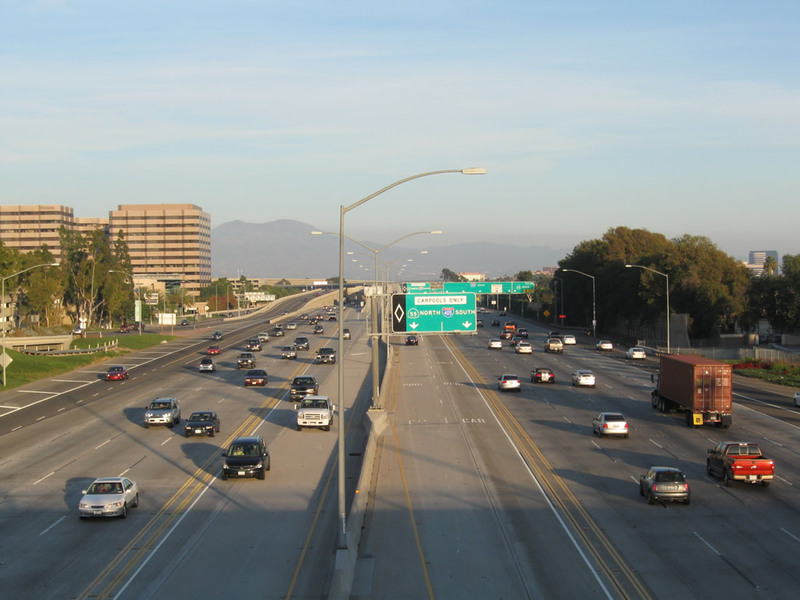 "Construction to begin on a $1.9 billion widening of the I-405 freeway in Orange County." The Orange County Register (CA), January 19, 2018.